Known as golden oranges in their native China, kumquats do indeed look like a miniature version of the citrus fruit. But with edible sweet skin and punchy, sour pulp, kumquats are in a category all their own. 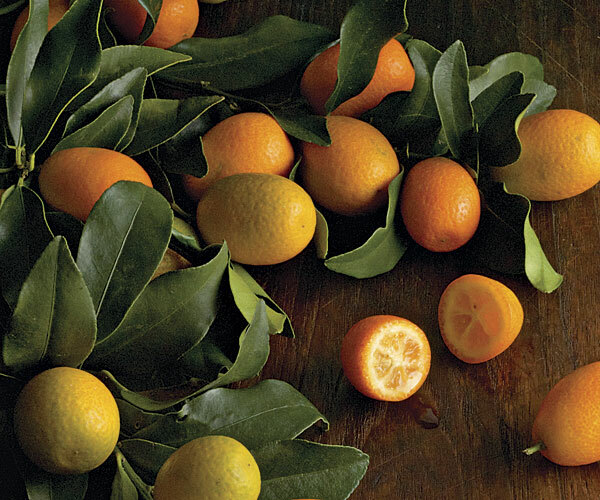 Kumquats make their cheerful arrival in grocery stores in December and stay until April. As symbols of prosperity, they’re especially common in Chinese markets for the Lunar New Year. Pick some up—you may not get rich, but you will have scored a delicious find. Classified in the genus Fortunella (named for Robert Fortune, the botanist who brought kumquats from China to the West in the mid-1800s), kumquats are part of the Rutaceae family, which also includes oranges, grapefruit, and lemons. “Kumquat” refers to both a small, shrub-like tree with dark-green leaves and to the fruit the tree produces. The most widely available variety of kumquat in the United States is the orange, oval, tart Nagami, which is typically 1 to 2 inches long and cultivated in California, Florida, and Texas. Look for kumquats that are bright orange to almost red, with firm, smooth skin and leaves attached (a sign of freshness). Traces of green may indicate an unripened fruit. The sour flavor of kumquats mellows when cooked, and the fruit produces an intoxicating citrus aroma. 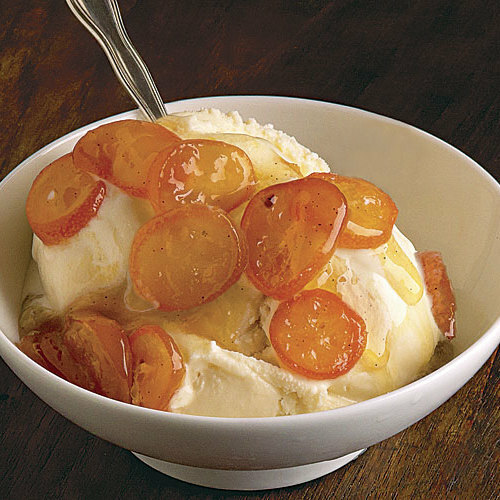 Kumquats are often candied in sugar syrup and then added to baked goods, ice cream, or trifles. 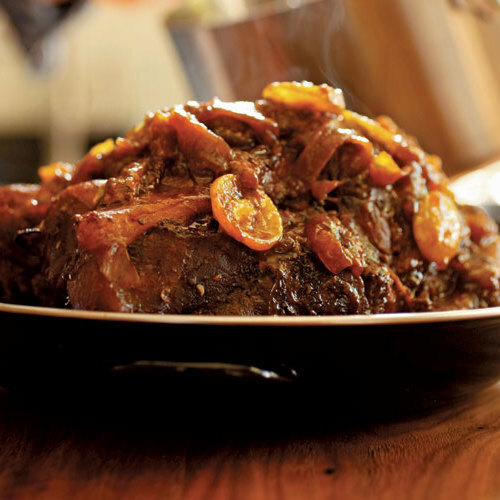 Kumquat marmalade or compote can be spread on toast or served with roasted duck. Simmer kumquats in citrus juice with a bit of honey, garlic, and herbs and serve alongside scallops or seared fish, or add them to a beef, pork, or chicken braise with dried fruit and spices. For a fresh take, thinly slice raw kumquats and add them to an escarole or spinach salad; chop and add them to a winter salsa or ceviche; muddle them with sugar for a bright cocktail; or simply eat them out of hand, the rind providing a sweet complement to the tart pulp. Store kumquats at room temperature for up to three days or refrigerate for up to two weeks. Serve this sweet-tart dessert sauce over vanilla ice cream or pound cake.